First, understand that timber trees generally come in two classes: coniferous and deciduous. The best way to tell these two classes apart is by whether the tree looses its leaves annually. Deciduous trees do but coniferous trees do not. Two defining features of coniferous trees are their pine cones and needles. Some examples of this class include hemlock, pine, spruce and cedar. Coniferous trees are usually more plentiful than deciduous, making them more common as timber frame pieces. Another aspect that makes this kind of timber common is known as “checking.” This is when wood splits while drying and coniferous trees are less susceptible to it than deciduous. It’s because of checking that newer timbers make popping and cracking sounds in the first few years of a home’s existence. In the deciduous category, you’ll find ash, maple, oak and cherry. The first two are usually not used for timber frames, but you can find oak and cherry in a variety of places for their strength and attractive wood grains. 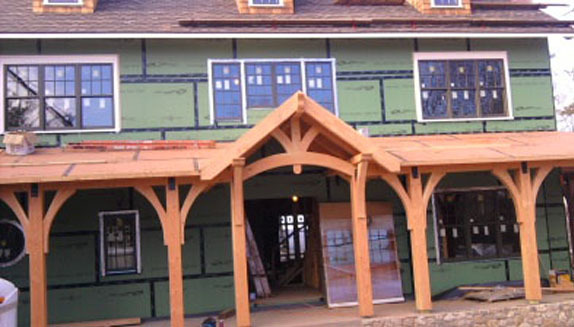 Though this kind of timber frame is more prone to checking, this rarely affects the stability when the timber is properly harvested and retains the “heart,” or inner rings of the tree. What is your timber frame made of? If your home is older, then it probably has local varieties depending on their strength and accessibility. Newer homes will use the strongest and most common of the coniferous and deciduous families listed above.